This week I observed a substitute teacher give an art lesson to third graders. Besides learning that this is a great way for a substitute teacher to engage a classroom and for students to learn about concentric circles and abstract art, I witnessed how art reaches some of the students whom do not usually seem completely engaged. It seems cliché, but after witnessing a student who is often withdrawn socially (and does have an IEP to help with this) reveal her creativity and be excited about other people’s appreciation of it, I, who was already a believer in the importance of arts education, saw first-hand how art can boost self-esteem, bring unknown attributes of a person to the forefront, and so much more that researchers have pointed out. The art displayed above is an in-progress example of the aforementioned student’s work. Normally, when I say hi to this student, I just get a pleasant glance through her hair which is usually covering her face, because her head is down. She does not welcome help with her work and usually sits alone at lunch. 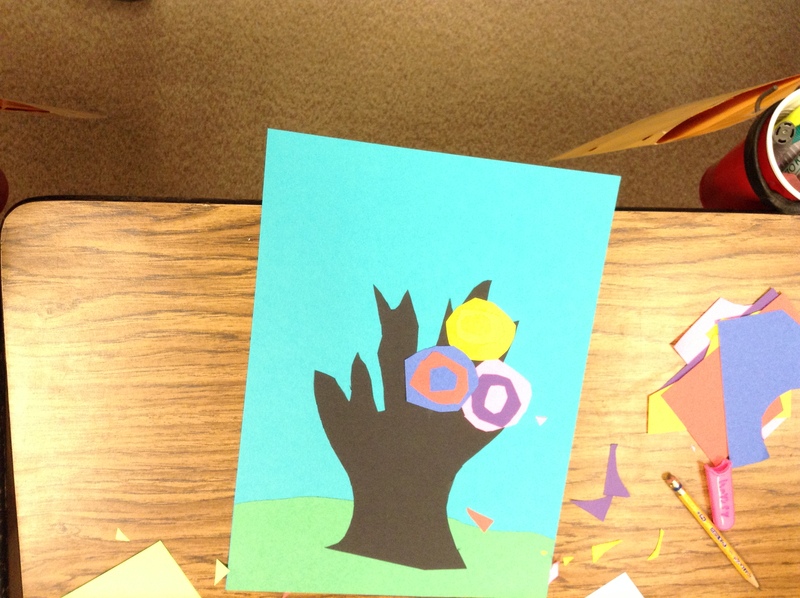 When the students made their tree and branches using a loose tracing around an arm and hand, she had the brilliant idea to make the ends of the branches jagged when she cut them. None of the other students thought to do this. I genuinely praised her choice, because it looked really cool, and the student sitting next to her then noticed it and copied her. I could tell she was really proud, and it opened up a communication between her and the girl who copied her idea. I asked if I could take some pictures of her work, which she let me do, and then I was completely surprised when she approached me at the end of the work period and asked if I would like a photo of her completed art. It felt so good to finally have a connection with this student and a glimpse into her mind. Maybe she will welcome help, or at least conversation, from me in the future. Maybe she will be more receptive to guidance from or sharing with others as a result of this positive experience. Most importantly, she seemed proud enough of her work to be willing to share a part of herself. Someday these will NOT be my desks, and in reality they are not right now. They are my son’s and daughter’s desks in our dining room that I commandeer when they are at school or not using them. The pile in between them is all of my PTSA Treasurer stuff. The pile of papers on the floor is my “to do” pile. I also have my mobile desk, otherwise known as a backpack with a netbook, which I use for school and when I’m on-the-go. As a dear classmate of mine pointed out, I will have my own teacher’s desk in the near future. Now that is exciting! 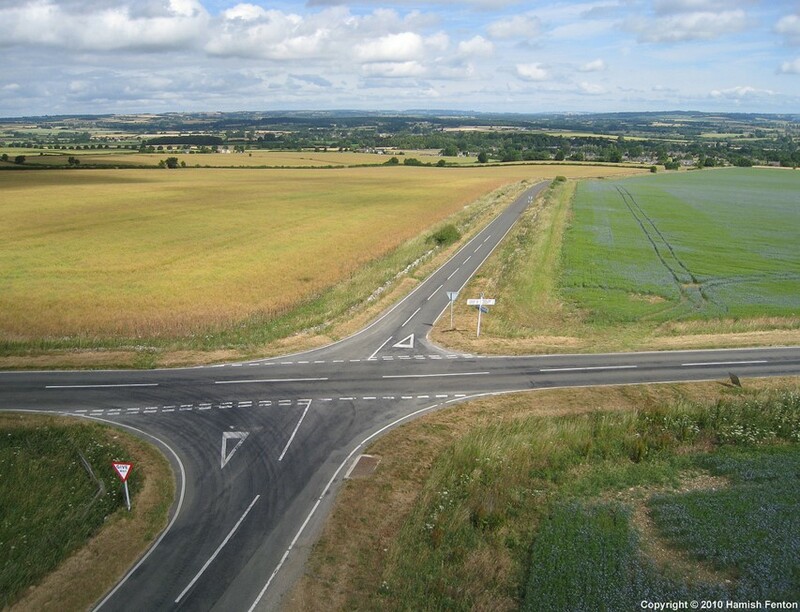 Teaching is like the crossroads’ juncture. Coming from different paths, teacher and student intersect here for awhile assessing one another, learning from one another, dancing together in hopes of avoiding collision, until the student is ready to travel down another road. At this critical juncture, teacher and student imagine where the different roads might lead and what challenges may be encountered along the way. Luckily, the teacher is an experienced traveler and has been trained in the rules of the road. She gives the student tools and practice with them so that bumps in the road and break-downs along the way can be overcome, and any unchartered territory can easily be navigated. Simulations of hardship situations are experienced in a safe environment to teach confidence and perseverance for when the road gets rough. Appreciation of beauty and nurturing of creativity are encouraged so that boredom does not make the journey tedious, and the student can arrive at the next destination excited and ready to prepare for the next trip.